Welcome to my web pages. list of my web pages with a short description. On this page you can find my Commodore collection. A few examples are: KIM-1, CBM, PET, VIC-20, C64, C128, C16, C116, Plus/4, Amiga, PC, C64DTV, MAX machine, VIC-1001, C65, The gold C64, disk-drives, datassettes, monitors, printers, joysticks, cartridges, software, articles,manuals and much more. 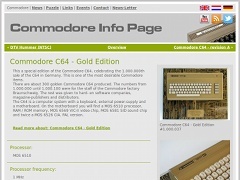 On this page you can find news items that are related to Commodore. Every week there are new news items. The items can also be viewed by category and there is a search function available. You can test yourself if you know everything about this legendary computer brand. Each month there is a new set of pictures. The pictures are taken from a Commodore item or an item that can be used with a Commodore. There is also a screen-shot from a game. 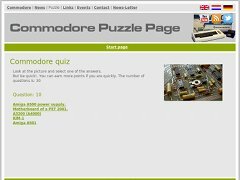 On this page you can find links to other web pages that are related to Commodore. The links are indexed by category. On this page you can find events that are related to Commodore. 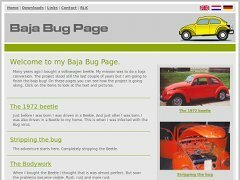 On this page you can see my Baja-bug. 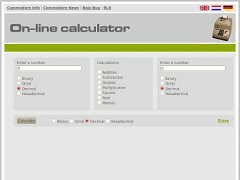 This is a on line calculator. The calculator can add, subtract, multiply and divide. Also the square, root and modulo can be calculated. Input and output may be: binary, octal, decimal or hexadecimal. 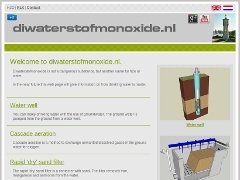 Information about Diwaterstofmonoxide, h2o or water.